DECLAN DEVINE wants to bring the fear factor back to Brandywell Stadium. 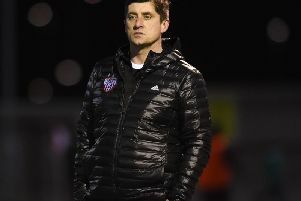 The newly installed Derry City boss can’t wait to get his second stint as manager of his hometown club underway and is ‘excited’ about leading his team out at the new-look Brandywell. Having watched the Candy Stripes’ dismal run of form at the Lone Moor Road venue last season and finish in seventh place in the league table, Devine is desperate to turn around the club’s fortunes in 2019. The former goalkeeper has pleaded with the people of Derry to come out and support the team in the 2019 campaign. “We’ve got to make sure we hit the ground running and I’m not afraid of that. Hopefully the people get behind us. “The more people come to Brandywell the more opportunity we have to be successful. We need the people getting behind the team. More than anything we need the Derry public to get back out and support their club. “Last year was the first year back in the new stadium and this year we need to make sure it’s full. We can’t do that on our own. We have to get the Derry public to stay with us, support the players and feel part of the football club. “We’ll be showing every single person in this city respect and hopefully they respect what we’re trying to do in terms of getting a good product onto the pitch that everybody can identify with and feel part of. Ultimately Derry City belongs to Derry people. Any team that comes to Brandywell we want it to be the case that they understand this is a place you have to work hard to get anything from.